I just changed from PFsense to OPNSense. In OPNSense i setup 2 OpenVPN Servers. Now I'm wondering both are not visible in the Lobby Traffic Graph. By default there is IPsec shown but I'm not running an IPsec VPN Server. Can I add both VPNServers in the Raffig Graph? Re: Lobby Traffic Graph no OpenVPN? I don't think there is a way to configure that. I use netdata/influxd/grafana to do all my graphing. That is not really good. At the moment I'm looking to move back to pfsense. You can use the Health->Reporting as well, but you aren't sharing too much info. 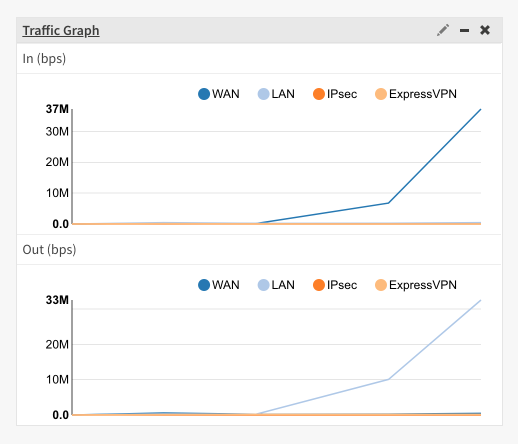 I'm Wunderding why I get at the Traffic Graph IPsec shown when there is no IPSec setuped. I setuped opnvpn but it looks there is no possibility to remove the IPSec and add openvpn. Did you use the wizard to config the openvpn? I just took a quick look, you have to choose the right interface (OpenVPN server in this case) in Traffic Graph. Beside that, by clicking on the IPsec marker you can disable it's graph. Couldn't find a way to set this for the widget on the dashboard.. It seems to only apply to the listing below the graph. Answer: You have to create a new interface in "Assignments" with the ovpns1 interface that should be created when you setup OpenVPN. Once created, you will enable the interface and then have the option to rename the interface. Make sure IPv4/6 configuration types are "none" and then save. No firewall rules should be needed or any further configuration at this point. HOWEVER!!!! .... The forum post mentions you MUST reboot before it works. I would see traffic on the graph but no pings. I had everything configured right but it simply did not work until I rebooted. Then all was well again. EDIT: As mentioned by Animosity022, you may be able to restart the VPN Server and everything work. No one was home so there was no issue rebooting my router so I did. You can just restart the VPN to make it work as well as I do that for my OpenVPN client.